Sending a “Thank You” note is a great thing. No doubt. We wish that more people took the time to put a pen to paper and write a thank you note, even a short one. A hand written thank you note is qualitatively better than an email and hands down better than just verbal thanks. Even better than a thank you note is a thoughtful Thank You gift that will both surprise and delight the person you want to thank. So if you want to raise the bar and say ‘Thank You’ in the most memorable way possible, consider sending a gift basket with your thank you note. The best gifts, thank you gifts included, are matched to the recipient’s particular interests and tastes, and also to how well you know them. The more you know about the recipient, the more specific the gift you can send. The goal is to send a gift that will be sure to please. The gift basket thank you note should also be tailored to the relationship you have with that person and to the specific reason for the thank you. We love this Chocolate Lover’s Gift Basket – the perfect way to say thanks to anyone with a sweet tooth on your list! When choosing a gift basket, be sure you really dig deep and consider what the recipient truly loves. Chocolate Lover? By all means send a chocolate gift basket like the one featured here as a token of your appreciation. Just look at all those chocolate-based ingredients! Yum! Your thoughtfulness will really be appreciated when you send a thank you gift basket that matches a person’s dietary restrictions or preferences. If you know someone is kosher, then of course you will want to send a kosher gift basket. If you know someone is vegan, you aren’t going to send a basket with prosciutto and Parmigiano! Tip: Keep dietary restrictions in mind when sending a thoughtful thank you gift. Think of a gift that shows your friend or colleague how well you know them. Many people adhere to special diets such as vegetarian, vegan, gluten-free, heart-healthy, low Glycemic, low carb and Mediterranean. And there are gift baskets to suit every persuasion, such as the vegan gift basket below. Sometimes you’ve discovered something so fabulous that you want to share it with friends. You know them well enough that you’re fairly certain that they’ll love it too. So, the next time you want to thank your neighbors for bringing in your mail, why not send them a thank you gift basket full of goodies that you love. In your thank you message, you’ll want to describe what you love about the gift and why you think they will find it irresistible too! Sometimes you will want to say thank you to a business colleague who referred a new client to you, for example, but you don’t know about her personal interests or tastes. A fresh fruit or fresh and dried fruit basket will please every palate and make a universally good gift basket to say ‘Thank You’, especially when the contents are of the highest quality and are stylishly arranged. Your gift basket thank you note will also be appropriately formal. A snack gift basket is a perfect thank you gift for a group – family or office. Try this healthy and tasty Pop Up Party basket. When sending a thank you gift to a family or an office, you can’t go wrong with a fun basket filled with lots of treats and snacks. Everyone has different tastes and variety is the best approach in this particular situation. Think about finding a gift with products that are easy to share: that can be put in an office lunchroom or in the family room in front of the TV. There are endless ways to create your own gift. You can buy a container and shop for the ingredients yourself. Think about going to your local farmer’s market and selecting a fresh, locally baked bread, an artisanal butter, fresh herbs and flowers to arrange in a basket. Custom gift idea with a cookbook and recipe ingredients. Or buy a copy of your favorite recipe book and include all the ingredients to make your favorite meal. Perhaps you have a favorite line of beauty care products that you want to share with a friend as a thank you. Designing your own gift baskets to say ‘Thank You’ involves time on your end, but the care you put into the gift basket will shine through and make your recipient feel even more appreciated. Build Your Own Basket (BYOB) with Manhattan Fruitier. Those gifts can be amazingly successful, but they take time to assemble, and you can have trouble shipping them if your recipient isn’t nearby. Another option for a custom thank you gift is to shop at an online store that offers customizable gifts. Here’s an example of our build your own basket (BYOB) which allows the shopper to select fresh fruits and sweet and savory additions from a list of options. Any gift basket, of course, will be accompanied by a thank you note. And just because you are sending a thank you gift, it doesn’t mean you can blow off the note attached to it! There are some tips to writing good thank you notes. First and foremost, keep the sentiment appropriate to the situation. You’ll want to be more formal with colleagues that you don’t know well, but that doesn’t mean you have to be cold and impersonal. Obviously, you can be goofier or more casual with good friends. The first key point is to be sincere. If you are sending a thank you gift, and not just a quick email note, then you must be feeling genuinely grateful. Be sure that your appreciation is communicated in your words. Secondly, be careful to address the note appropriately: using first names in the salutation is not always proper. Make sure you feel comfortable with your choice. The body of the thank you note doesn’t need to be long, but it does need to be as specific as possible. If there is an identifiable deed, act or accomplishment that deserves a ‘Thank You’, make sure you mention it in your gift basket thank you note. Finally, do carefully consider the closing or valediction when writing your gift basket thank you note. “Sincerely”, “With Gratitude”, and “With Thanks” always work in a thank you note, especially with business associates. These are formal, but expressing the sentiment perfectly. With friends you can be as informal as you like. But do be sure to communicate your true appreciation. A thank you gift basket isn’t necessarily about sending something that someone needs. It’s about sending something a person will enjoy. Whether you make it yourself, customize it, or select it from a collection, we can’t think of a gift better than a basket filled with beautiful, delicious, fresh, and nourishing treats. Your gift basket will say thank you in an unforgettable way and will take your thank you note to new heights. This Chinese New Year, the year of the Fire Rooster, begins on January 28. During the two-week celebration of the New Year, family and friends gather for feasting and to honor household and heavenly deities. It is one of the grandest, most celebratory annual events throughout the world. Originating in the ancient Shang Dynasty (17 to 11 BC), this lively holiday was a way to ward off the legendary monster “Nian,” who loved to feast on little children and farm animals. Along with his appetite, Nian had some peculiar hang ups. He detested the color red and abhorred loud noise. So people decorated their houses in brilliant reds and set off fire crackers in the streets to send Nian away for another year. 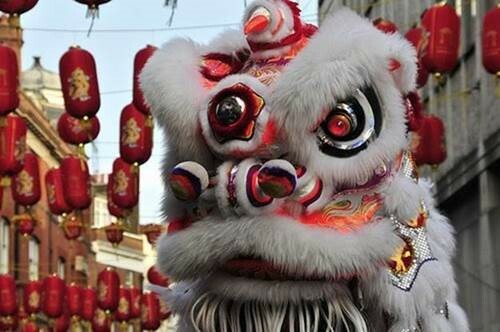 Even though China adopted the Western calendar and January 1st as an official New Year date, the Lunar New Year is still of the utmost cultural and historical importance. Chinese continue to celebrate the traditions and customs of Lunar New Year, albeit now with a shorter new name – the Spring Festival. 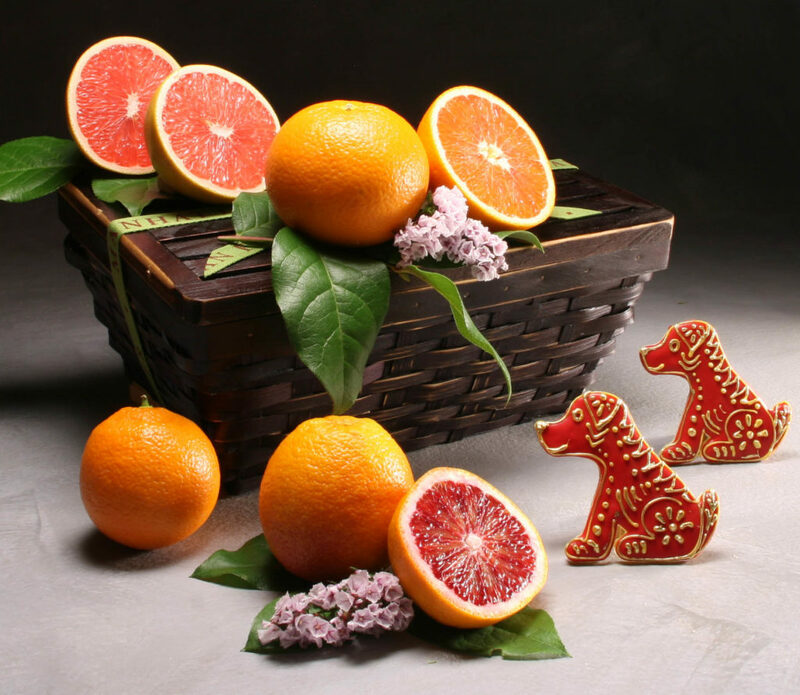 During the Spring Festival, mandarin oranges, tangerines, pomelos and all types of citrus are gifted as tokens of good fortune, happiness and abundance. These fruits are displayed on kitchen tables throughout the two week celebration as a harbinger of a healthy, hopeful and prosperous New Year to come. 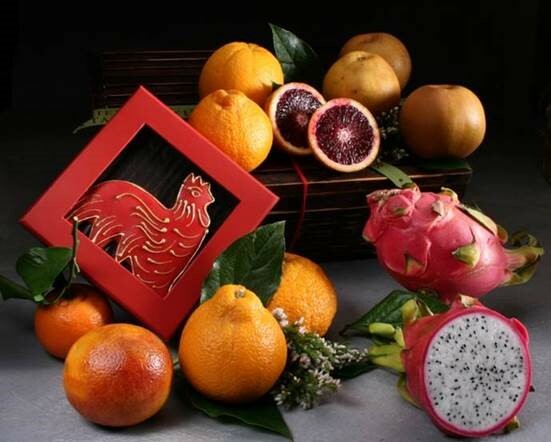 Another highly-prized celebratory fruit during the Spring Festival is the Dragon Fruit or Pitahaya. Wildly popular for its brilliant fuschia-pink coloring – some believe the color of luck – Dragon Fruit is often placed on altars for the Lunar New Year. 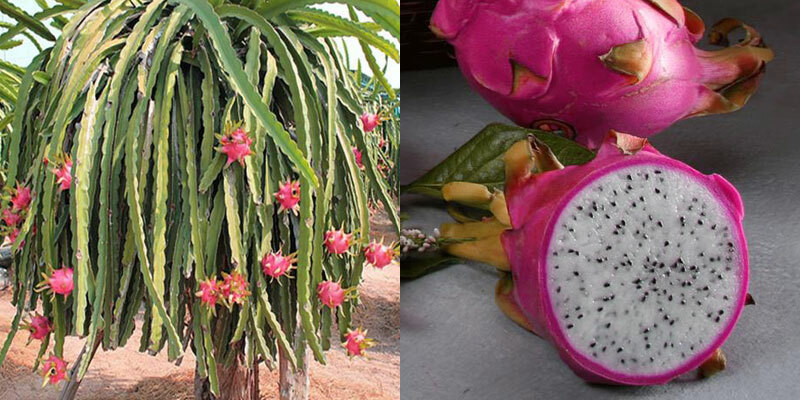 Dragon fruit, or pitahaya, is actually a vine-like cactus that originated in the Americas but became almost exclusively popular in East and Southeast Asia over many years. It’s a fruit both moody and mysterious. The pitahaya’s aromatic flowers bloom one night only, on the full moon, and can only grow by nocturnal pollinators that bring this magical fruit to fruition. The white flesh of the Dragon Fruit is soft like a ripe peach and is easily eaten with a spoon once you cut the fruit in half. It has tiny black seeds that are easy to eat. The flesh is slightly sweet with a touch of lemon flavor. Delicious as well as exotically colored, it will ward off the monster Nian until at least 2018. This 2017 Lunar New Year Spring Festival begins on January 28th . If you happen to be in New York City, check out the New Year’s Day Firecracker Ceremony and Cultural Festival, kicking off at Chinatown’s Sara Roosevelt Park. Usher out the New Year celebrations on February 5th with a bang and clang two weeks later at the dazzling Lunar New Year Parade in Chinatown.